Doctor Strange: Season One has been sat on my shelf for perhaps longer than it should have. First, I'm pretty sure this was a present, so it's a bit embarrassing that I've left it this long. Second, I have been meaning to look into Doctor Strange comics a bit more ever since watching the film with Benedict Cumberbatch, which even he couldn't ruin for me. 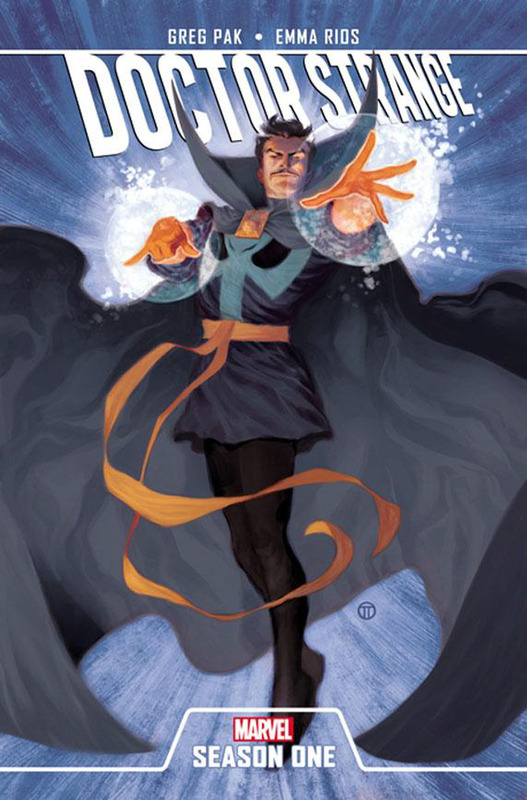 Doctor Strange: Season One recounts the origins of the eponymous Doctor Strange. When a talented but arrogant surgeon loses the use of his hands after a car accident, he travels to the Himalayas to seek the aid of a sorcerer known as the Ancient One. Whilst training there, he meets and butts heads with a fellow apprentice, a martial artist named Wong. Together they must fight Mordo, a former student turned to evil by the power of the demon Dormammu. This version of the Doctor Strange origin is decently written, if not exactly hugely original. The story only really starts when Strange arrives at the Ancient One's mountain home. After the initial confrontation with Mordo, the bulk of the story focusing on Strange and Wong's rocky enemies-to-friends relationship. While the whole head vs heart thing has been done countless times before, it's always fun to see when it's done well. It coincides nicely with Strange's development into a decent human being too. The best part of the book though has to be the artwork. Emma Rios has taken what is a decent enough but unremarkable retelling of Doctor Strange's origin and makes it a wonder to behold. You could really tell that Rios enjoyed the full-page panels full of magical energies and god-heads, because they're a sight to behold, with such care and detail. The character designs are also interestingly angular, which is kind of unusual considering that a lot of comics aim for clean lines. The main story is followed by the first chapter of Matt Fraction's run of The Defenders. It wasn't bad, per se, but I couldn't help but feel that it was a bit out of place after the weirdness of Doctor Strange.